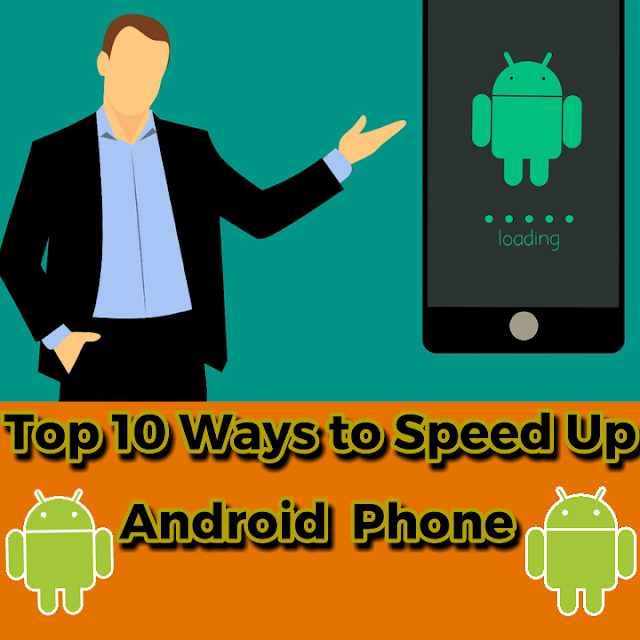 How to speed up android phone | How to make android phone run faster | Top 10 ways to speed up android phone : Android phones launched these days are highly speed targeted by the manufacturers and are packed with several built-in sets of features supporting the android device to run faster at any specific condition. High speed processors along with a super faster RAM helps the mobile phone devices to maintain an equilibrium in processing any particular task with dedicated super fast speed. Latest android versions integrated in the newly launched mobile phones also supports the devices to perform much better in speed as compared to the previously launched versions. Android phones are available to get purchased with greater internal memory supporting the device to store any amount of information in the form of texts, images, graphics, audios or even the videos as well inside itself without integration of any external memory cards. Android featured phones are also well known to be searched if lost by chance using the most famous Android device manager tool provided under the interface. Despite of all these fully loaded set of features in the latest android phones, most of them use to get slow down during the course of time. The main reason stands behind the slow down of the android mobile phone is that the phone often needs regular monitoring and cleaning functionalities which needs to be carried out by the owner of the android phone. However, most of the people who are not at all tech savvy and are limited only up to calling and messaging kind of facilities often ignores the proper care of the phone. During the course of time, most of the junk files often gets stored in the phone memory in the form of cached data, meaningless files and waste folders which use to take a loot of phone's space which makes the device slow. Due to limited knowledge about increasing up the android phone's speed, most of the users who are not well aware of the proper ways to increase the speed often use to install some of the speed booster kinds of app from the play store and tries to clean to their device with one go. But, these apps does not prove themselves as much compatible as per the user's expectations and ultimately the speed of the android phone becomes worst even after their regular uses. The home screen of the android phone must always be kept clean and there must not be any live wallpaper kind of stuff used in the device. Apps in the form of widgets which keeps themselves continuously updating must be removed from the phone as all of them always results in slowing down the phone and get themselves refreshed every time the users use to unlock their android phone. Activating up of the data saver mode inside the Chrome browser of the smartphone helps the users to browse the websites extremely faster. The data saver mode in the phone enables the users to surf the websites without waiting for a long time after pressing the enter key. This mode compresses the pages as per the user's requirements using an extremely lesser amount of data following which the page loads much faster. Users are instead required to compromise a little with high end video and picture quality as the speed of the internet browsing matters the most. The auto-sync facility can be effectively monitored using the Settings option in most of the android based phones. Users can have a best control by accessing the option over there and can decide the particular apps which needs to get synced in the background. Other than the required apps which needs to get synced, all the other apps being processed in the background must be kept off performing the syncing activity and thereby increasing the android phone's speed. Most of the users use to install the task killer kind of apps to kill the tasks running in the phone's background. They most often shuts down the task instantly but such activities are good to be done by the android itself. Sudden shutting down the task and again reopening up of the similar task by the android operating system takes time for the task to start from the very beginning and the entire procedures slows down the phone. Clearing up of the useless cached data inside the phone by the users is extremely desired for increasing the speed of the android phone and to make the device run faster. Most of the devices are already provided with an option to clear the cache instantly from the phone with a single tap. However, there also exists several other apps to do the cache clearing activity and to make the device run extremely faster. It is better to completely remove the useless applications which use to execute in the background while performing any useful operation. Monitoring all such applications running the background and stopping them to execute with ongoing activity will help the phone to improve the processing speed because the RAM space gets vanished and a fresh processing environment with high speed will automatically process up our ongoing phone's processing and thereby increasing the speed of the android mobile phone. Installation of custom ROM for any professional android smartphone user will be extremely beneficial for experiencing several additional features with a much better speed and compatibility. The users who are well aware of performing routing activity on the android phone will get the benefit of upgrading the android operating system to a latest version even if the device does not seem compatible with the same. This is one of the biggest benefits which can be achieved soon after installation of the custom ROM inside the device. Keeping the android phone updated with the latest operating system version helps the users to remove the bugs and keep the device updated with recent optimization features along with best and advanced user interfaces. Instead, the latest android OS version provides the users with latest android updates which proves extremely helpful for the users. Factory reset feature is one of the most important and useful features given along with any android enabled smartphone. Whenever everything goes wrong and the overcrowding and overloading related functionalities slows the android phone down, then it is better to go for a factory reset to provide the phone with a new and refreshed lifestyle. After opting the option, the required password as per the phone's manufacturer needs to be given and after which the phone gets restarted with a completely new set of features and experience. Regular optimization of the android phone's battery is needed to be done at regular intervals. Most of the times, the battery life of the phone gets drained out very quickly and this happens mainly due to the execution of the battery consuming apps which regularly use to execute in the background. Users need to click on the Settings and target Battery. Soon after this step, they need to Force Stop the unwanted apps to remove the same from getting executed in the background. The above list of 10 useful tips must be followed by an android phone user to speed up the android phone and make it run faster than ever. With the grand launch of Android Oreo and Android P, the functionalities have become more advanced with lots of interactive user interfaces with all the latest android enabled device.